Flash Freeze will result in some icing on area roadways. A strong cold front will move across the region followed by a rapid drop in temperature through the 30s and into the 20s. 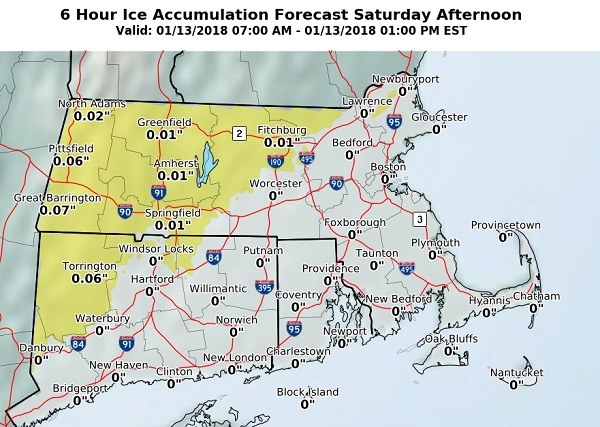 Temps will drop below freezing during the next few hours in the interior, between noon and 2 pm in the coastal plain from Boston to Providence, and 2 to 4 pm along the immediate south coast and Cape/Islands. The colder air will be accompanied by brief northwest wind gusts to 40 to 50 mph. While drying will occur, some icy spots will develop, especially interior locations, as any standing water quickly freezes. Motorists should use caution and be prepared for some icy spots.